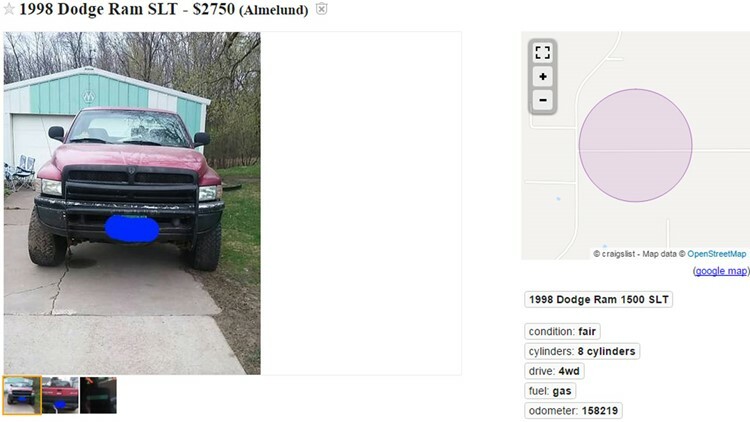 ALMELUND, Minn. - The "World's Meanest Mom" is selling her 15-year-old daughter's truck on Craigslist to teach her a lesson. Amy Adams writes in the Craigslist ad, which was posted Tuesday, the reason she's selling the truck -- or what she calls "every teenage kid's dream vehicle" is because her daughter has "decided that her grades don't matter, that she can disrespect myself and her siblings on a daily basis, and that she has the right to skip school and run away from home." Adams writes the title of the vehicle is in her name so she's selling the 1998 Dodge Ram for $2,750. "She was on her 'one more chance and the truck was getting sold.' And she blew that 'one more chance' on Monday when she decided to skip school," Adams said. The ad continues to say, she's willing to sell it back to the original owner but with certain conditions. If the person driving the truck on a daily basis will be attending North Branch high school next year, you will get a $300 discount. Why? Because I AM the World's Meanest Mom, and would love for her to be reminded every day next year of all of the mistakes she made. The ad drips with sarcasm, but Adams says it's also drenched with truth -- challenging the idea that parents need to act as friends. "Where's that going to leave them five years from now, 10 years from now, when they're walking around disrespecting the wrong people?" Adams said. Adams says she received more than 400 responses to the ad. "Over half of them were other parents saying, hey, high five," Adams said. According to Adams, her daughter's friends apparently flagged her Craigslist ad, forcing it to be removed. So she posted it again. And it was flagged and removed a second time. To those who think she went too far, Adams says she knows exactly how her daughter feels. Because she says she was once a 15-year-old with attitude. "To my mom, I was short tempered. I was snippy. And I was obnoxious," Adams said. To Adams, her own mother once was the "meanest mom in the world." Adams is just glad she matured enough to thank her for it before her mother died. "The moment they diagnosed her as terminal. We had that conversation," Adams said. "She’s been gone for, it will be 10 years this July." Adams hopes one day her daughter will appreciate her tough parenting. "I hope she realizes that it's OK to discipline your kids. And it's OK to have expectations. And it's OK for them to have consequences," Adams said.